Drawing on influences from iconic artists that have inspired them on their musical journey – The Beatles, The Stones, Bowie, Fleetwood Mac, Led Zeppelin, Pink Floyd, Neil Young, Tom Petty, Dire Straits, Elvis Costello through to Crowded House/The Finns, Goldenhorse, Stereophonics and Elbow to name quite a few– it’s no surprise that Late Model European’s new single Summer Rain is insanely catchy with a wide-ranging appeal. 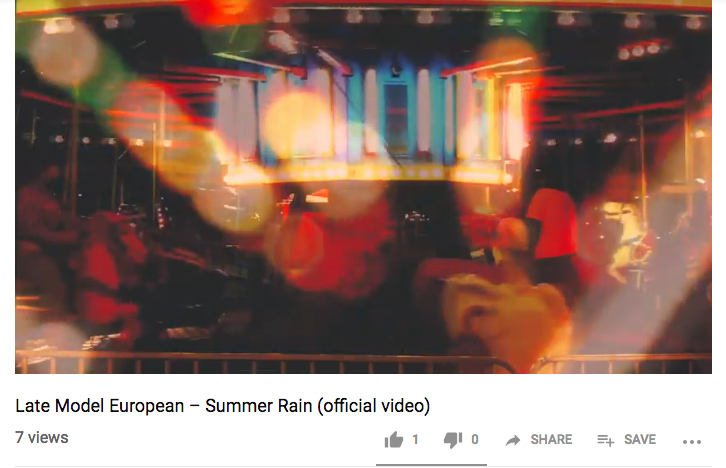 Featuring the backing vocals of iconic kiwi chanteuse Dianne Swann, Summer Rain is an upbeat, feel-good, summery track, but it goes deeper than that. Says Tones, "In a literal sense, it’s a romance; it’s about romantic relationships – the ‘summer’ season of a relationship; that magic. At times we can drift away a little (or a lot). The dream can also slip away; if you let it. It’s about holding on to that dream, that romance, that love, that feeling; living life to the fullest." Summer Rain was recorded at Roundhead Studios with producer Ben King (Goldenhorse/Grand Rapids) at the helm, and mastered by Don Bartley (Benchmark Mastering – Sydney),the single features top kiwi musicians, Tom Broome, Ben King, Dianne Swan, Jacob O’Callaghan alongside John and Tones. Summer Rain is now available from Spotify, Apple Music, iTunes and all good digital outlets.